Broken Garage Door Springs? Don’t Fix Yourself – Hire a Pro! Broken garage door springs is one of the most common problems people run into. The good news is that there are ways to fix it as well as ways to prepare for it. It is important to know that whatever you do, don’t attempt to repair the broken springs yourself as it can be an extremely dangerous task. Always hire a professional because they will have the right tools and experience to handle the task safely and efficiently. If you have older garage door springs, it is probably time for an inspection. The springs typically last around 10,000 cycles which averages out to about 7 years. After that timeframe, things start to become dangerous because the broken springs could lash out at any time. If your springs aren’t that old, there are some ways to prolong the life of your garage door parts, and our pros can help show you what to do. In the meantime, we recommend an annual multipoint safety inspection which covers all moving parts of your door to give you peace of mind that everything is running smoothly. Although there are some things in your garage that you can fix by yourself, the garage door springs are not one of those things. We can’t stress the importance of hiring a professional enough. The more wear and tear the torsion or extension springs have, the more unpredictable they can be when fixing them. We are available 24/7 for emergencies, don’t hesitate to call if you are in need. All garage door springs are under extreme tension because they are tightly wound which makes them unsafe for inexperienced people to modify and if you think about the job the springs have to do, it makes sense. The springs are responsible for lifting and lowering a 500 pound door multiple times a day. Our trained technicians have seen every type of door there is and we will only recommend to you what needs to be fixed – nothing more. 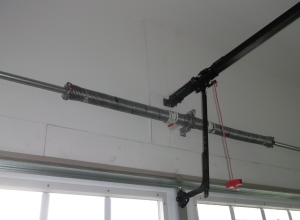 Whether you have torsion or extension springs, Rockstar Garage Door Services has you covered!